"I love Roquefort dressing, but have never really found a bottled brand that I like. This is wonderful! Hope you like it. Be sure to use a real mayonnaise rather than Miracle Whip for this one." In a medium bowl, whisk together the sour cream, vinegar, mayonnaise, salt, garlic powder and celery salt. Crumble cheese to desired fineness and whisk into dressing. 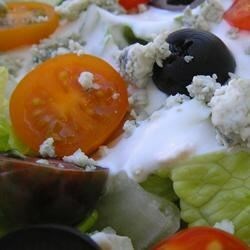 See how to make creamy, chunky-style blue cheese salad dressing from scratch. I was looking for a dressing like my favorite restaurants and I found it in this one! It is fantastic! Thank You Rumba! This is just what I was looking for and it is delicious!!! I have not been able to find bottled Roquefort around here and now I can make my own.